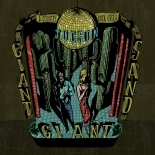 Tune in Monday night, July 30th, at 9pm for a special in-studio performance with Giant Giant Sand on Locals Only. Just when you thought Giant Sand couldn't get any bigger, Howe Gelb has done just that by regrouping, expanding and magnifying his vision with the newest version of Giant Sand, calling it (appropriately enough) GIANT GIANT SAND. They'll be playing cuts from their new album Tucson, released last month on Fire Records.